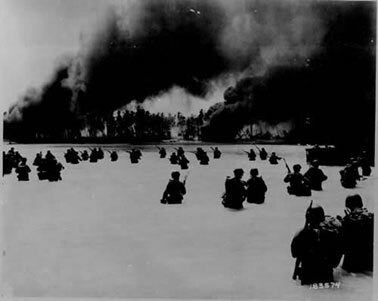 Module 2: "Tarawa and Peleliu"
Bring your listeners a new perspective on the incredible sacrifice in the overlooked Pacific Campaign of World War II. Independent Minds: At War in the Pacific storms onto the islands spread across 5,000 miles of ocean that would turn into a tropical hell. From inside the foxholes discover the story of young and idealistic Marines; John Basilone, Robert Leckie, Sydney Phillips and E.B. Sledge, as they come of age in weeks and months of searing combat. David D’Arcy hosts this compelling radio hour. 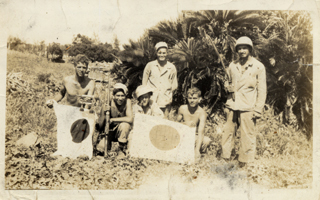 We hear how the Pacific conflict shaped the lives of these Marines and course of our nation. We meet the friends and relatives who shouldered the burden state-side. 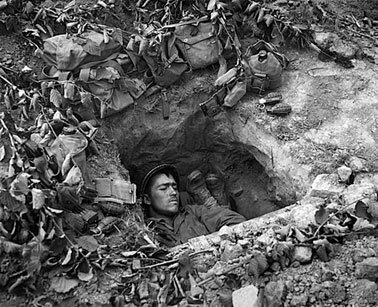 From historians Donald Miller and Richard Frank, we comprehend what those battles meant – then and now. Filmmakers Steven Spielberg and Tom Hanks share the challenges of bringing new light and depth to a major historic event. To broadcast this program, register HERE. - HBO’s miniseries, "The Pacific"
- Oral history project documenting the experience of the Japanese American soldiers of WWII. - Studs Terkel—interviews from his oral history project "The Good War"
- Sledge, E.B. With the Old Breed: At Peleliu and Okinawa. Intro by Paul Fussell. Oxford University Press, 1990. - Leckie, Robert. Helmet For My Pillow. Random House, 1957. - Studs Terkel. The Good War: An Oral History of WWII. Pantheon, 1984. - Saburo Hayashi and Alvin Coox. Kogun: The Japanese Army in the Pacific War. Marine Corps Assoc., 1959. - Bradley, James and Ron Powers. Flags of Our Fathers: The Battle of Iwo Jima. Bantam, 2000. - Spector, Ronald. Eagle against the Sun. Vintage, 1985. - Toland, John. The Rising Sun: The Decline and Fall of the Japanese Empire, 1936-1945. Modern Library, 2003. - Rhodes, Richard. The Making of the Atomic Bomb. Simon & Schuster, 1995. - Dower, John. War Without Mercy. Pantheon, 1987. - Jerry Cutter---Author of I’m Staying with My Boys: the Heroic Life of Sgt. John Basilone and founder of the John Basilone Foundation. - Diane Hawkins---Niece of John Basilone and producer of the film John Basilone: The Legacy of a Hero. - Donald Miller---Historian, professor, and author of eight books, including Lewis Mumford, A Life. - Phillip Glass---Musician, composer of "The Fog of War" soundtrack featured in our program. Support for this program comes from HBO--presenting "At War in The Pacific . " INDEPENDENT MINDS: At War in The Pacific is an hour-long special.